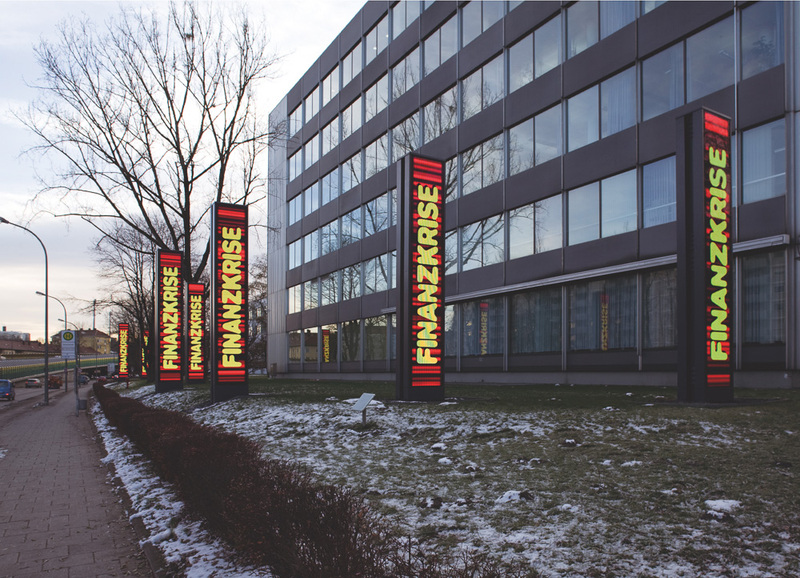 Screensavers is the name Bjørn Melhus has given his digital clones, which populate the SEVEN SCREENS in front of the OSRAM Haus for a couple of months. With these sound reactive computer animations, the images and texts of which are generated from a real (live) radio program, the artist renders the everyday language of mass media visible. Bjørn Melhus lives in a media-driven culture, as an analyst, protagonist and – like us all – a consumer. In his work, unlike other artists, he deals with the stocktaking of media-cultural creations, such as film and television, and thereby scrutinizes the reciprocal relationships between the individual, the masses and the medium. A recurring motif is the double (Superhero), the reproduced individual who is always embodied by the artist himself. Like an archeologist, Melhus trawls the media and cultural history of the 20th and 21st centuries in order to address the question of human identity in the context of a completely media-driven western culture. The artist‘s Screensavers are a response to the present comeback of superheroes in the mass media, a phenomenon that recurs in periods of general uncertainty. 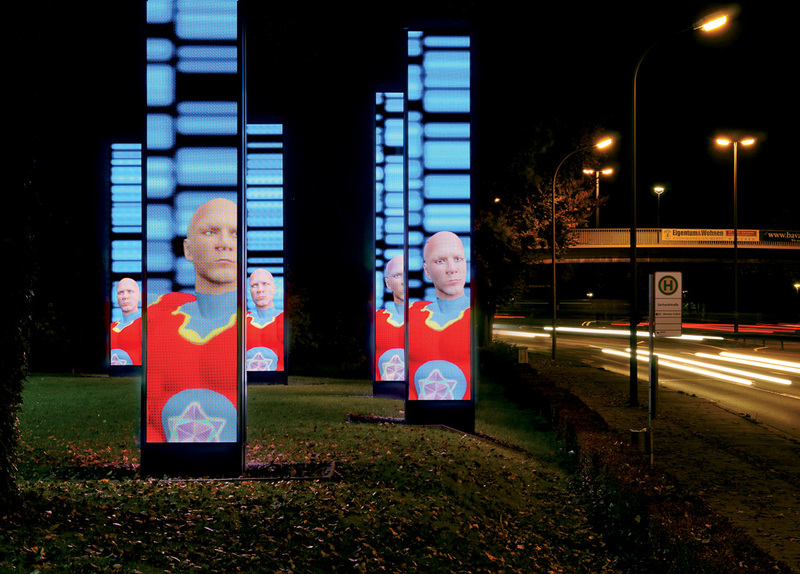 In doing this the connection between the self-embodied comic heroes, created by Bjørn Melhus in the Screensavers, and the latest news reports lead to an interplay made up of facts and fiction. The art project itself thus becomes a reflection of the media world today. For the interactive video installation Screensavers Bjørn Melhus uses acoustic material taken in real time from the radio programme as his base ingredient. However, although the acoustic level is the starting point for Screensavers, the reception of this acoustic level is not a prerequisite for the understanding of the work because the spoken messages of the radio programme are reduced to key words which are in turn projected onto the seven columns thus creating new contexts and associations. With his newest work the artists reacts also to the very special location of this installation. The Mittlere Ring is a road in Munich which is an extremly busy traffic node with approximately 90.000 cars driving past the light columns of the SEVEN SCREENS every day. All these 90000 cars (and their passengers) are potential recipients all possibly connected via an invisible public space – the radio broadcast. If TV is the specific mass medium connecting millions of living rooms, the radio is the mass medium for the car driver. This is the starting point for Screensavers in which Bjørn Melhus makes use of the radio for his work.